unknown property in cosmology that causes the expansion of the universe to accelerate. Assuming that the standard model of cosmology is correct, the best current measurements indicate that dark energy contributes 68% of the total energy in the present-day observable universe. 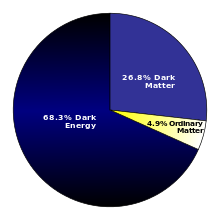 The mass–energy of dark matter and ordinary (baryonic) matter contribute 27% and 5%, respectively, and other components such as neutrinos and photons contribute a very small amount. The density of dark energy is very low (~ 7 × 10−30 g/cm3) much less than the density of ordinary matter or dark matter within galaxies. However, it dominates the mass–energy of the universe because it is uniform across space. The cosmological constant was first proposed by Einstein as a mechanism to obtain a solution of the gravitational field equation that would lead to a static universe, effectively using dark energy to balance gravity. Einstein gave the cosmological constant the symbol Λ (capital lambda). Einstein stated that the cosmological constant required that `empty space takes the role of gravitating negative masses which are distributed all over the interstellar space'.. The nature of dark energy is more hypothetical than that of dark matter, and many things about it remain in the realm of speculation. Dark energy is thought to be very homogeneous and not very dense, and is not known to interact through any of the fundamental forces other than gravity. Since it is quite rarefied and un-massive — roughly 10−27 kg/m3 — it is unlikely to be detectable in laboratory experiments. The reason dark energy can have such a profound effect on the universe, making up 68% of universal density in spite of being so dilute, is that it uniformly fills otherwise empty space. Independently of its actual nature, dark energy would need to have a strong negative pressure (repulsive action), like radiation pressure in a metamaterial, to explain the observed acceleration of the expansion of the universe. According to general relativity, the pressure within a substance contributes to its gravitational attraction for other objects just as its mass density does. This happens because the physical quantity that causes matter to generate gravitational effects is the stress–energy tensor, which contains both the energy (or matter) density of a substance and its pressure and viscosity[dubious – discuss]. In the Friedmann–Lemaître–Robertson–Walker metric, it can be shown that a strong constant negative pressure in all the universe causes an acceleration in the expansion if the universe is already expanding, or a deceleration in contraction if the universe is already contracting. This accelerating expansion effect is sometimes labeled "gravitational repulsion". The density of the dark energy might have varied in time during the history of the universe. Modern observational data allow us to estimate the present density of the dark energy. Using baryon acoustic oscillations, it is possible to investigate the effect of dark energy in the history of the Universe, and constrain parameters of the equation of state of dark energy. To that end, several models have been proposed. One of the most popular models is the Chevallier–Polarski–Linder model (CPL). Some other common models are, (Barboza & Alcaniz. 2008), (Jassal et al. 2005), (Wetterich. 2004),(Oztas et al. 2018). ^  Frieman, Turner & Huterer (2008) p. 6: "The Universe has gone through three distinct eras: radiation-dominated, z ≳ 3000; matter-dominated, 3000 ≳ z ≳ 0.5; and dark-energy-dominated, z ≲ 0.5. The evolution of the scale factor is controlled by the dominant energy form: a(t) ∝ t2/3(1 + w) (for constant w). 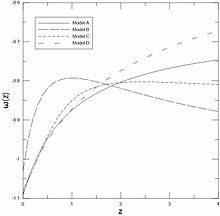 During the radiation-dominated era, a(t) ∝ t1/2; during the matter-dominated era, a(t) ∝ t2/3; and for the dark energy-dominated era, assuming w = −1, asymptotically a(t) ∝ exp(Ht)." ^ Peebles, P. J. E.; Ratra, Bharat (2003). "The cosmological constant and dark energy". Reviews of Modern Physics. 75 (2): 559–606. arXiv:astro-ph/0207347. Bibcode:2003RvMP...75..559P. doi:10.1103/RevModPhys.75.559. ^ Overbye, Dennis (25 February 2019). "Have Dark Forces Been Messing With the Cosmos? – Axions? Phantom energy? Astrophysicists scramble to patch a hole in the universe, rewriting cosmic history in the process". The New York Times. Retrieved 26 February 2019. ^ Ade, P. A. R.; Aghanim, N.; Armitage-Caplan, C.; et al. (Planck Collaboration), C.; Arnaud, M.; Ashdown, M.; Atrio-Barandela, F.; Aumont, J.; Aussel, H.; Baccigalupi, C.; Banday, A. J.; Barreiro, R. B.; Barrena, R.; Bartelmann, M.; Bartlett, J. G.; Bartolo, N.; Basak, S.; Battaner, E.; Battye, R.; Benabed, K.; Benoît, A.; Benoit-Lévy, A.; Bernard, J.-P.; Bersanelli, M.; Bertincourt, B.; Bethermin, M.; Bielewicz, P.; Bikmaev, I.; Blanchard, A.; et al. (22 March 2013). "Planck 2013 results. I. Overview of products and scientific results – Table 9". Astronomy and Astrophysics. 571: A1. arXiv:1303.5062. Bibcode:2014A&A...571A...1P. doi:10.1051/0004-6361/201321529. ^ Ade, P. A. R.; Aghanim, N.; Armitage-Caplan, C.; et al. (Planck Collaboration), C.; Arnaud, M.; Ashdown, M.; Atrio-Barandela, F.; Aumont, J.; Aussel, H.; Baccigalupi, C.; Banday, A. J.; Barreiro, R. B.; Barrena, R.; Bartelmann, M.; Bartlett, J. G.; Bartolo, N.; Basak, S.; Battaner, E.; Battye, R.; Benabed, K.; Benoît, A.; Benoit-Lévy, A.; Bernard, J.-P.; Bersanelli, M.; Bertincourt, B.; Bethermin, M.; Bielewicz, P.; Bikmaev, I.; Blanchard, A.; et al. (31 March 2013). "Planck 2013 Results Papers". Astronomy and Astrophysics. 571: A1. arXiv:1303.5062. Bibcode:2014A&A...571A...1P. doi:10.1051/0004-6361/201321529. Archived from the original on 23 March 2013. ^ a b "First Planck results: the Universe is still weird and interesting". 2013-03-21. ^ Sean Carroll, Ph.D., Caltech, 2007, The Teaching Company, Dark Matter, Dark Energy: The Dark Side of the Universe, Guidebook Part 2 page 46. Retrieved Oct. 7, 2013, "...dark energy: A smooth, persistent component of invisible energy, thought to make up about 70 percent of the current energy density of the universe. Dark energy is known to be smooth because it doesn't accumulate preferentially in galaxies and clusters..."
^ Paul J. Steinhardt; Neil Turok (2006). "Why the cosmological constant is small and positive". Science. 312 (5777): 1180–1183. arXiv:astro-ph/0605173. Bibcode:2006Sci...312.1180S. doi:10.1126/science.1126231. PMID 16675662. ^ "Dark Energy". Hyperphysics. Retrieved January 4, 2014. ^ Ferris, Timothy. "Dark Matter(Dark Energy)". Retrieved 2015-06-10. ^ "Moon findings muddy the water". Archived from the original on 2016-11-22. Retrieved 2016-11-21. ^ a b Carroll, Sean (2001). "The cosmological constant". Living Reviews in Relativity. 4 (1): 1. arXiv:astro-ph/0004075. Bibcode:2001LRR.....4....1C. doi:10.12942/lrr-2001-1. PMC 5256042. PMID 28179856. Archived from the original on 2006-10-13. Retrieved 2006-09-28. ^ Harvey, Alex (2012). "How Einstein Discovered Dark Energy". arXiv:1211.6338 [physics.hist-ph]. ^ O’Raifeartaigh C., O’Keeffe M., Nahm W. and S. Mitton. (2017). 'Einstein’s 1917 Static Model of the Universe: A Centennial Review'. Eur. Phys. J. (H) 42: 431–474. ^ Gamow, George (1970) My World Line: An Informal Autobiography. p. 44: "Much later, when I was discussing cosmological problems with Einstein, he remarked that the introduction of the cosmological term was the biggest blunder he ever made in his life." – Here the "cosmological term" refers to the cosmological constant in the equations of general relativity, whose value Einstein initially picked to ensure that his model of the universe would neither expand nor contract; if he hadn't done this he might have theoretically predicted the universal expansion that was first observed by Edwin Hubble. ^ a b Riess, Adam G.; Filippenko; Challis; Clocchiatti; Diercks; Garnavich; Gilliland; Hogan; Jha; Kirshner; Leibundgut; Phillips; Reiss; Schmidt; Schommer; Smith; Spyromilio; Stubbs; Suntzeff; Tonry (1998). "Observational evidence from supernovae for an accelerating universe and a cosmological constant". Astronomical Journal. 116 (3): 1009–38. arXiv:astro-ph/9805201. Bibcode:1998AJ....116.1009R. doi:10.1086/300499. ^ a b Perlmutter, S.; Aldering; Goldhaber; Knop; Nugent; Castro; Deustua; Fabbro; Goobar; Groom; Hook; Kim; Kim; Lee; Nunes; Pain; Pennypacker; Quimby; Lidman; Ellis; Irwin; McMahon; Ruiz‐Lapuente; Walton; Schaefer; Boyle; Filippenko; Matheson; Fruchter; et al. (1999). "Measurements of Omega and Lambda from 42 high redshift supernovae". Astrophysical Journal. 517 (2): 565–86. arXiv:astro-ph/9812133. Bibcode:1999ApJ...517..565P. doi:10.1086/307221. 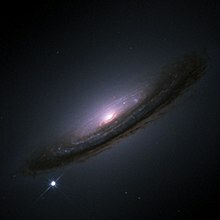 ^ The first appearance of the term "dark energy" is in the article with another cosmologist and Turner's student at the time, Dragan Huterer, "Prospects for Probing the Dark Energy via Supernova Distance Measurements", which was posted to the ArXiv.org e-print archive in August 1998 and published in Huterer, D.; Turner, M. (1999). "Prospects for probing the dark energy via supernova distance measurements". Physical Review D. 60 (8): 081301. arXiv:astro-ph/9808133. Bibcode:1999PhRvD..60h1301H. doi:10.1103/PhysRevD.60.081301. , although the manner in which the term is treated there suggests it was already in general use. Cosmologist Saul Perlmutter has credited Turner with coining the term in an article they wrote together with Martin White, where it is introduced in quotation marks as if it were a neologism. Perlmutter, S.; Turner, M.; White, M. (1999). "Constraining Dark Energy with Type Ia Supernovae and Large-Scale Structure". Physical Review Letters. 83 (4): 670–673. arXiv:astro-ph/9901052. Bibcode:1999PhRvL..83..670P. doi:10.1103/PhysRevLett.83.670. ^ Astier, Pierre (Supernova Legacy Survey); Guy; Regnault; Pain; Aubourg; Balam; Basa; Carlberg; Fabbro; Fouchez; Hook; Howell; Lafoux; Neill; Palanque-Delabrouille; Perrett; Pritchet; Rich; Sullivan; Taillet; Aldering; Antilogus; Arsenijevic; Balland; Baumont; Bronder; Courtois; Ellis; Filiol; et al. (2006). "The Supernova legacy survey: Measurement of ΩM, ΩΛ and W from the first year data set". Astronomy and Astrophysics. 447 (1): 31–48. arXiv:astro-ph/0510447. Bibcode:2006A&A...447...31A. doi:10.1051/0004-6361:20054185. ^ Overbye, Dennis (2003-07-22). "Astronomers Report Evidence of 'Dark Energy' Splitting the Universe". The New York Times. Retrieved August 5, 2015. ^ Zhong-Yue Wang (2016). "Modern Theory for Electromagnetic Metamaterials". Plasmonics. 11 (2): 503–508. doi:10.1007/s11468-015-0071-7. ^ Daniel Baumann. "Cosmology: Part III Mathematical Tripos, Cambridge University" (PDF). p. 21−22. ^ Durrer, R. (2011). "What do we really know about Dark Energy?". Philosophical Transactions of the Royal Society A: Mathematical, Physical and Engineering Sciences. 369 (1957): 5102–5114. arXiv:1103.5331. Bibcode:2011RSPTA.369.5102D. doi:10.1098/rsta.2011.0285. PMID 22084297. ^ The first paper, using observed data, which claimed a positive Lambda term was Paál, G.; et al. (1992). "Inflation and compactification from galaxy redshifts?". Astrophysics and Space Science. 191 (1): 107–24. Bibcode:1992Ap&SS.191..107P. doi:10.1007/BF00644200. ^ "The Nobel Prize in Physics 2011". Nobel Foundation. Retrieved 2011-10-04. ^ The Nobel Prize in Physics 2011. Perlmutter got half the prize, and the other half was shared between Schmidt and Riess. ^ a b Spergel, D. N. (WMAP collaboration); et al. (March 2006). "Wilkinson Microwave Anisotropy Probe (WMAP) three year results: implications for cosmology". ^ Durrer, R. (2011). "What do we really know about dark energy?". Philosophical Transactions of the Royal Society A. 369 (1957): 5102–5114. arXiv:1103.5331. Bibcode:2011RSPTA.369.5102D. doi:10.1098/rsta.2011.0285. PMID 22084297. ^ Kowalski, Marek; Rubin, David; Aldering, G.; Agostinho, R. J.; Amadon, A.; Amanullah, R.; Balland, C.; Barbary, K.; Blanc, G.; Challis, P. J.; Conley, A.; Connolly, N. V.; Covarrubias, R.; Dawson, K. S.; Deustua, S. E.; Ellis, R.; Fabbro, S.; Fadeyev, V.; Fan, X.; Farris, B.; Folatelli, G.; Frye, B. L.; Garavini, G.; Gates, E. L.; Germany, L.; Goldhaber, G.; Goldman, B.; Goobar, A.; Groom, D. E.; et al. (October 27, 2008). "Improved Cosmological Constraints from New, Old and Combined Supernova Datasets". The Astrophysical Journal. 686 (2): 749–778. arXiv:0804.4142. Bibcode:2008ApJ...686..749K. doi:10.1086/589937. . They find a best-fit value of the dark energy density, ΩΛ of 0.713+0.027–0.029(stat)+0.036–0.039(sys), of the total matter density, ΩM, of 0.274+0.016–0.016(stat)+0.013–0.012(sys) with an equation of state parameter w of −0.969+0.059–0.063(stat)+0.063–0.066(sys). 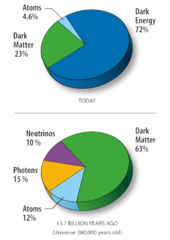 ^ "Content of the Universe – Pie Chart". Wilkinson Microwave Anisotropy Probe. National Aeronautics and Space Administration. Retrieved 9 January 2018. ^ "Big Bang's afterglow shows universe is 80 million years older than scientists first thought". The Washington Post. Archived from the original on 22 March 2013. Retrieved 22 March 2013. ^ "New method 'confirms dark energy'". BBC News. 2011-05-19. ^ Crittenden; Neil Turok (1996). "Looking for $\Lambda$ with the Rees-Sciama Effect". Physical Review Letters. 76 (4): 575–578. arXiv:astro-ph/9510072. Bibcode:1996PhRvL..76..575C. doi:10.1103/PhysRevLett.76.575. PMID 10061494. ^ Shirley Ho; Hirata; Nikhil Padmanabhan; Uros Seljak; Neta Bahcall (2008). "Correlation of CMB with large-scale structure: I. ISW Tomography and Cosmological Implications". Physical Review D. 78 (4): 043519. arXiv:0801.0642. Bibcode:2008PhRvD..78d3519H. doi:10.1103/PhysRevD.78.043519. ^ Tommaso Giannantonio; Ryan Scranton; Crittenden; Nichol; Boughn; Myers; Richards (2008). "Combined analysis of the integrated Sachs-Wolfe effect and cosmological implications". Physical Review D. 77 (12): 123520. arXiv:0801.4380. Bibcode:2008PhRvD..77l3520G. doi:10.1103/PhysRevD.77.123520. ^ Zelong Yi; Tongjie Zhang (2007). "Constraints on holographic dark energy models using the differential ages of passively evolving galaxies". Modern Physics Letters A. 22 (1): 41–54. arXiv:astro-ph/0605596. Bibcode:2007MPLA...22...41Y. doi:10.1142/S0217732307020889. ^ Haoyi Wan; Zelong Yi; Tongjie Zhang; Jie Zhou (2007). "Constraints on the DGP Universe Using Observational Hubble parameter". Physics Letters B. 651 (5): 1368–1379. arXiv:0706.2723. Bibcode:2007PhLB..651..352W. doi:10.1016/j.physletb.2007.06.053. ^ Cong Ma; Tongjie Zhang (2011). "Power of Observational Hubble Parameter Data: a Figure of Merit Exploration". Astrophysical Journal. 730 (2): 74. arXiv:1007.3787. Bibcode:2011ApJ...730...74M. doi:10.1088/0004-637X/730/2/74. ^ Tongjie Zhang; Cong Ma; Tian Lan (2010). "Constraints on the Dark Side of the Universe and Observational Hubble Parameter Data". Advances in Astronomy. 2010 (1): 1. arXiv:1010.1307. Bibcode:2010AdAst2010E..81Z. doi:10.1155/2010/184284. ^ Joan Simon; Licia Verde; Raul Jimenez (2005). "Constraints on the redshift dependence of the dark energy potential". Physical Review D. 71 (12): 123001. arXiv:astro-ph/0412269. Bibcode:2005PhRvD..71l3001S. doi:10.1103/PhysRevD.71.123001. ^ "Planck reveals an almost perfect universe". Planck. ESA. 2013-03-21. Retrieved 2013-03-21. ^ Wess, Julius; Bagger, Jonathan (1992). Supersymmetry and Supergravity. ISBN 978-0691025308. ^ Ratra, Bharat; Peebles, P.J.E. (1988). "Cosmological consequences of a rolling homogeneous scalar field". Phys. Rev. D37 (12): 3406–3427. Bibcode:1988PhRvD..37.3406R. doi:10.1103/PhysRevD.37.3406. ^ Steinhardt, Paul J.; Wang, Li-Min; Zlatev, Ivaylo (1999). "Cosmological tracking solutions". Phys. Rev. D59 (12): 123504. arXiv:astro-ph/9812313. Bibcode:1999PhRvD..59l3504S. doi:10.1103/PhysRevD.59.123504. ^ R.R.Caldwell (2002). "A phantom menace? Cosmological consequences of a dark energy component with super-negative equation of state". Physics Letters B. 545 (1–2): 23–29. arXiv:astro-ph/9908168. Bibcode:2002PhLB..545...23C. doi:10.1016/S0370-2693(02)02589-3. ^ Rafael J. F. Marcondes (5 October 2016). "Interacting dark energy models in Cosmology and large-scale structure observational tests". arXiv:1610.01272 [astro-ph.CO]. ^ Exirifard, Q. (2011). "Phenomenological covariant approach to gravity". General Relativity and Gravitation. 43 (1): 93–106. arXiv:0808.1962. Bibcode:2011GReGr..43...93E. doi:10.1007/s10714-010-1073-6. ^ Chevallier, M; Polarski, D (2001). "Accelerating Universes with Scaling Dark Matter". International Journal of Modern Physics D. 10 (2): 213–224. arXiv:gr-qc/0009008. Bibcode:2001IJMPD..10..213C. doi:10.1142/S0218271801000822. ^ Linder, Eric V. (3 March 2003). "Exploring the Expansion History of the Universe". Physical Review Letters. 90 (9): 091301. arXiv:astro-ph/0208512v1. Bibcode:2003PhRvL..90i1301L. doi:10.1103/PhysRevLett.90.091301. PMID 12689209. ^ Alcaniz, E.M.; Alcaniz, J.S. (2008). "A parametric model for dark energy". Physics Letters B. 666 (5): 415–419. arXiv:0805.1713. Bibcode:2008PhLB..666..415B. doi:10.1016/j.physletb.2008.08.012. ^ Jassal, H.K; Bagla, J.S (2010). "Understanding the origin of CMB constraints on Dark Energy". Monthly Notices of the Royal Astronomical Society. 405 (4): 2639–2650. arXiv:astro-ph/0601389. Bibcode:2010MNRAS.405.2639J. doi:10.1111/j.1365-2966.2010.16647.x. ^ Wetterich, C. (2004). "Phenomenological parameterization of quintessence". Physics Letters B. 594 (1–2): 17–22. arXiv:astro-ph/0403289v1. Bibcode:2004PhLB..594...17W. doi:10.1016/j.physletb.2004.05.008. ^ Oztas, A.; Dil, E.; Smith, M.L. (2018). "The varying cosmological constant: a new approximation to the Friedmann equations and universe model". Mon. Not. R. Astron. Soc. 476 (1): 451–458. Bibcode:2018MNRAS.476..451O. doi:10.1093/mnras/sty221. ^ Oztas, A. (2018). "The effects of a varying cosmological constant on the particle horizon". Mon. Not. R. Astron. Soc. 481 (2): 2228–2234. Bibcode:2018MNRAS.481.2228O. doi:10.1093/mnras/sty2375. ^ Wiltshire, David L. (2007). "Exact Solution to the Averaging Problem in Cosmology". Physical Review Letters. 99 (25): 251101. arXiv:0709.0732. Bibcode:2007PhRvL..99y1101W. doi:10.1103/PhysRevLett.99.251101. PMID 18233512. ^ Ishak, Mustapha; Richardson, James; Garred, David; Whittington, Delilah; Nwankwo, Anthony; Sussman, Roberto (2008). "Dark Energy or Apparent Acceleration Due to a Relativistic Cosmological Model More Complex than FLRW?". Physical Review D. 78 (12): 123531. arXiv:0708.2943. Bibcode:2008PhRvD..78l3531I. doi:10.1103/PhysRevD.78.123531. ^ Mattsson, Teppo (2010). "Dark energy as a mirage". Gen. Rel. Grav. 42 (3): 567–599. arXiv:0711.4264. Bibcode:2010GReGr..42..567M. doi:10.1007/s10714-009-0873-z. ^ Clifton, Timothy; Ferreira, Pedro (April 2009). "Does Dark Energy Really Exist?". Scientific American. 300 (4): 48–55. Bibcode:2009SciAm.300d..48C. doi:10.1038/scientificamerican0409-48. PMID 19363920. ^ Wiltshire, D. (2008). "Cosmological equivalence principle and the weak-field limit". Physical Review D. 78 (8): 084032. arXiv:0809.1183. Bibcode:2008PhRvD..78h4032W. doi:10.1103/PhysRevD.78.084032. ^ Gray, Stuart (2009-12-08). "Dark questions remain over dark energy". ABC Science Australia. Retrieved 27 January 2013. ^ Merali, Zeeya (March 2012). "Is Einstein's Greatest Work All Wrong—Because He Didn't Go Far Enough?". Discover magazine. Retrieved 27 January 2013. ^ Tsagas, Christos G. (2011). "Peculiar motions, accelerated expansion, and the cosmological axis". Physical Review D. 84 (6): 063503. arXiv:1107.4045. Bibcode:2011PhRvD..84f3503T. doi:10.1103/PhysRevD.84.063503. ^ J. T. Nielsen; A. Guffanti; S. Sarkar (21 October 2016). "Marginal evidence for cosmic acceleration from Type Ia supernovae". Scientific Reports. 6: 35596. arXiv:1506.01354. Bibcode:2016NatSR...635596N. doi:10.1038/srep35596. PMC 5073293. PMID 27767125. ^ Stuart Gillespie (21 October 2016). 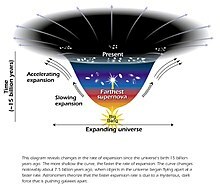 "The universe is expanding at an accelerating rate – or is it?". University of Oxford – News & Events – Science Blog (WP:NEWSBLOG). ^ Austin Joyce; Lucas Lombriser; Fabian Schmidt (2016). "Dark Energy vs. Modified Gravity". Annual Review of Nuclear and Particle Science. 66. arXiv:1601.06133. Bibcode:2016ARNPS..66...95J. doi:10.1146/annurev-nucl-102115-044553. ^ Lombriser, Lucas; Lima, Nelson (2017). "Challenges to Self-Acceleration in Modified Gravity from Gravitational Waves and Large-Scale Structure". Physics Letters B. 765: 382–385. arXiv:1602.07670. Bibcode:2017PhLB..765..382L. doi:10.1016/j.physletb.2016.12.048. ^ "Quest to settle riddle over Einstein's theory may soon be over". phys.org. February 10, 2017. Retrieved October 29, 2017. ^ "Theoretical battle: Dark energy vs. modified gravity". Ars Technica. February 25, 2017. Retrieved October 27, 2017. ^ Siegel, Ethan (2018). "What Astronomers Wish Everyone Knew About Dark Matter And Dark Energy". Forbes (Starts With A Bang blog). Retrieved 11 April 2018. ^ a b Frieman, Joshua A.; Turner, Michael S.; Huterer, Dragan (2008-01-01). "Dark Energy and the Accelerating Universe". Annual Review of Astronomy and Astrophysics. 46 (1): 385–432. arXiv:0803.0982. Bibcode:2008ARA&A..46..385F. doi:10.1146/annurev.astro.46.060407.145243. ^ Krauss, Lawrence M.; Scherrer, Robert J. (March 2008). "The End of Cosmology?". Scientific American. 82. Retrieved 2011-01-06. ^ a b Lineweaver, Charles; Tamara M. Davis (2005). "Misconceptions about the Big Bang" (PDF). Scientific American. Archived from the original (PDF) on 2011-07-19. Retrieved 2008-11-06. ^ Loeb, Abraham (2002). "The Long-Term Future of Extragalactic Astronomy". Physical Review D. 65 (4): 047301. arXiv:astro-ph/0107568. Bibcode:2002PhRvD..65d7301L. doi:10.1103/PhysRevD.65.047301. ^ How the Universe Works 3. End of the Universe. Discovery Channel. 2014. ^ Steinhardt, P. J.; Turok, N. (2002-04-25). "A Cyclic Model of the Universe". Science. 296 (5572): 1436–1439. arXiv:hep-th/0111030v2. Bibcode:2002Sci...296.1436S. doi:10.1126/science.1070462. PMID 11976408. ^ Merritt, David "Cosmology and Convention", Studies In History and Philosophy of Science Part B: Studies In History and Philosophy of Modern Physics, 57(1):41–52, February 2017. This page was last edited on 13 April 2019, at 19:49 (UTC).